Whether you’ve owned your truck for a decade or have just become the proud new owner of a truck, if it’s your first time off-roading with your rig there are some things you need to do or rather check off your list, before you hit the trails less traveled. You may be wondering, if you really need to modify your truck to make it off-road ready and the simple answer is maybe. 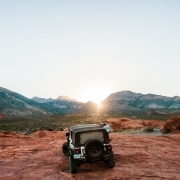 Depending on what type of truck you’re starting out with and what type of outdoor adventure suits your fancy, will determine the additional upgrades and St. George off-road truck parts you need. For example, if you just plan on taking a meandering journey through a relatively flat trail with minimal inclines, a.k.a easy, a good set of tires is probably the only off-road accessory you’ll need to add. 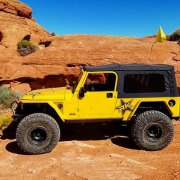 However, if you plan on taking your ride up treacherous terrain and heart-dropping heights to seek stellar views and really see what your off-road vehicle and you are made of, you’ll want to add a few additional mods to your truck. 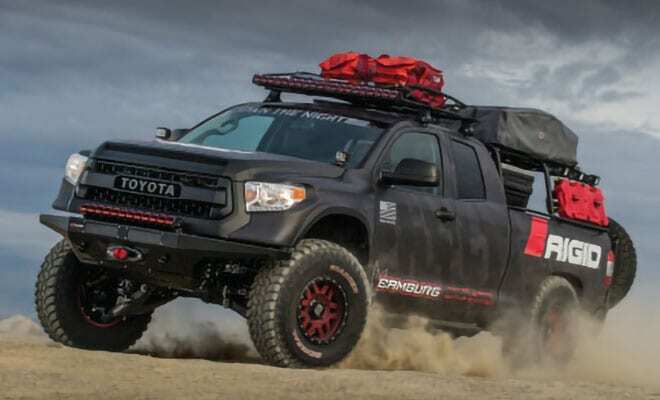 This article offers information on the basic modifications you can add to your truck using St. George off-road truck accessories that won’t empty your pocket, as well as upgrades that can turn your straightforward pick up into a showstopping, trail-blazing machine. The right tires and the right tire pressure – Off-road, low pressure tires allow your tire to connect to the ground easier, adding more traction. Which is always a good thing when you’re driving up or down a mountain side. Ground clearance – Low riding vehicles have a higher chance of scraping rocks or getting stuck. This is perfectly fine for flat trails, but if you plan on doing anything else make sure you have enough clearance by getting either a lift kit, larger tires or ideally both. Undercarriage protection – Boulders and rough terrain on the trail can really mess up the undersides of your truck and it’s never fun being stuck in the middle of nowhere with a ripped oil pan. Do yourself a favor and protect your investment, buy buying a skid plate. 4 Wheel Drive – Getting stuck is something that just happens when your off-roading, especially for extreme off-roaders, that’s why many of them won’t go without 4WD. Off-roading can be done with 2WD vehicles, but if you plan on off-roading for awhile and on medium or hard trails, we suggest investing in a 4WD truck. Emergency Supplies – This is a must. Extra water, fuel, food, medical supplies, tools, an air compressor fire extinguisher and anything else you think you may need are always a good thing to have. If something breaks (on you or your ride) you want to be prepared as much as possible. 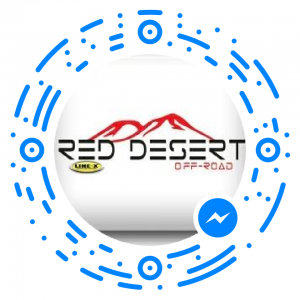 You can find the parts you need for your off-road truck at Red Desert off-road truck accessory store in St. George. For example, tires, lift kits, and undercarriage protection and shields can all be found at our store for a multitude of trucks. If your truck currently is rocking tires that were designed for paved roads, you’ll want to switch them out for tires that were made for the conditions you’ll be driving in such as, gravel, dirt, mud and sand. Most off-road tires that people choose are low pressure and larger, but they don’t have to be. A larger tire will add height to your ride, so if you’re hurting for ground clearance this is a smart off-road truck part to start with as you’ll essentially be taking care of two things on your checklist at once: tires and ground clearance. However, just because a tire is larger doesn’t necessarily mean it will provide more traction. If it’s traction you really want, you’ll want to get a winch or traction locker, but If your budget is a little tighter, we highly recommend getting fitted for off-road tires first. The next essential off-road truck accessory in St. George we recommend is an off-road lift kit. If you plan on rumbling down rocky mountain terrain or taking your ride through any deep streams, you’re going to make sure you have the ground clearance, via a lift kit. Lift kits can provide better suspension, ground clearance, added safety and increased towing capabilities, plus you’ll be able to make room for larger tires. 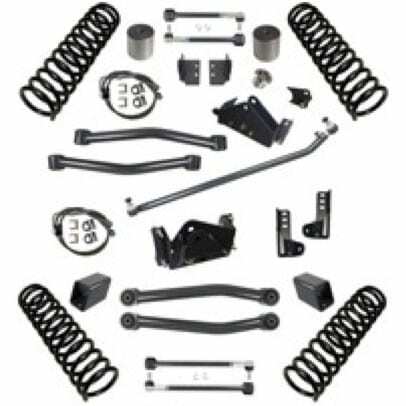 You can find the best lift kit for your truck’s year, make and model here. 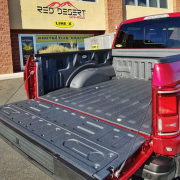 Protecting the underneath of your truck with a heavy-duty skid plate isn’t where your protection should end, but if that’s all that’s in your budget right now, it’s a great place to start! 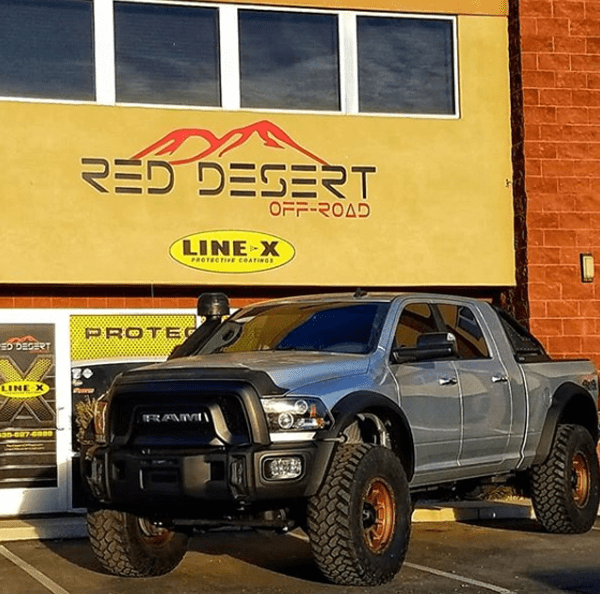 For additional protection you can add off-road truck parts in St. George like rocker panels, bumper guards, LINE-X spray-on bedliners, bull bar, and tonneau covers to keep your ride looking as good as it rides. 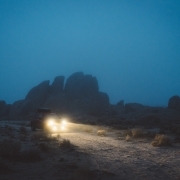 Off-Road Lighting – You’ll see the difference immediately once you equip your off-road truck with either LED, HID (High Intensity Discharge) or Halogen off-road lighting features. Hi-Lift Jack – If you ever need some extra help getting out of a tough spot, this is a versatile product that is smart to have on hand. Winches – This should almost be in the basic category, but we’ll keep it in the extra list for now. Off-roading can be dangerous and having a winch to pull you or a friend out when you’re stuck is always a good back-up plan. 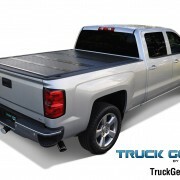 LINE-X Bedliner – So nice, we’re mentioning it twice! 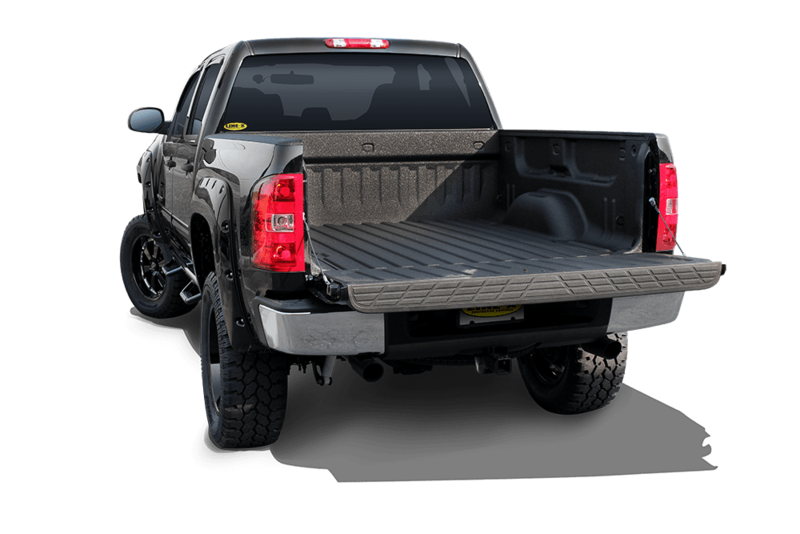 But seriously, if you plan on taking your truck anywhere and loading up cargo, it’s best to protect the inside of your truck bed with a superior truck bedliner from LINE-X. 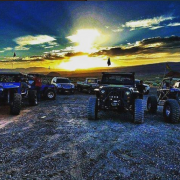 Our professionals will install it for you and send you on your way when you stop in our St. George off-road accessory store. 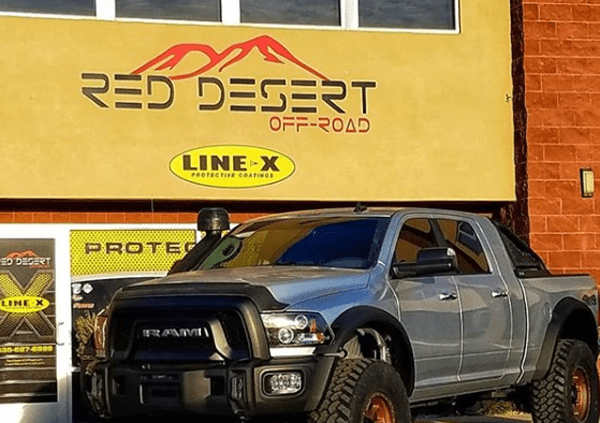 If you’re still not sure about which off-road accessories are best for your truck and your wallet, contact us or come see us at our St. George showroom today. We’ll help you pick out everything you need to hit the open road that ensures your safety and shows off your rig in the best possible way.